Happy Dogs’ Kennel in Khanapur is a training and boarding school for your doggos. It has a sprawling lawn, kennels and you can trust this place to take care of puppers while you’re vacationing too. Originally started to be a space that only trains dogs, Happy Dogs’ Kennel has become synonymous with pet care and pet therapy, in the city today. 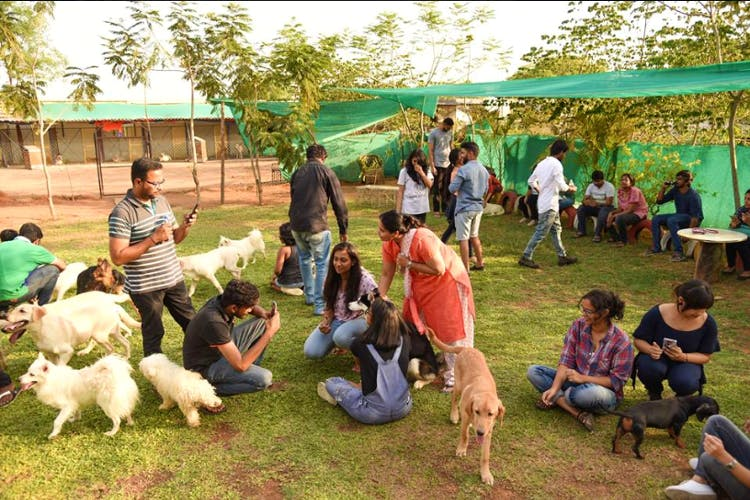 Looking at how the customers spent hours playing with the fur-balls here, the founder, Anand, decided to introduce de-stressing events. The kennel is spread across four acres of land, and it’s a clean paradise for your precious. Anand is the head trainer, and apparently his understanding of animal psychology is impressive. He has a group of efficient assistants who will also take care of your fur babies here. Whether your pet is aggressive and needs to be calmed, is scared of other dogs or needs potty training, this is the place to take them to. You can also go on business trips and vacations without having to worry about them because at Happy Dogs Kennel, pets are taken care of in such a way that the shock of your absence will not be harsh on them. In fact, they will be much more confident and cuddly by the time you're back. Be it 3 days or 3 months, you can rely on this place to not only keep your puppy poo happy but to also get regular updates about their well-being with photos! Keeping in mind the rising violence against dogs in the city, this place also takes in rescue dogs and helps them overcome trauma. They hold educative programmes to teach the importance of kindness towards animals to kids and adults alike. In addition to this, Happy Dogs Kennel is a place where you can take bae for a cuddly surprise, but be sure to speak to the owner and book a time in advance. The prices for the services vary based on the kind of training you are seeking, number of days you want to leave your pet here or the amount of time you want to play with them for.